I am just loving the flavor of these pumpkin chai donuts! I have been into all things chai flavored lately. First there was my flourless chai sandwich cookies and then my coconut vanilla chai ice cream. Now these delectable donuts. These are vegan and gluten free. The chai flavor was perfect with the pumpkin. I hope you enjoy it as well. If you are not into chai flavors, but love pumpkin, you can always make these muffins instead. If you donut have a donut pan, you can always make these into muffins. You may have to adjust the cooking time though. These would also be delicious with this frosting recipe spread on top. 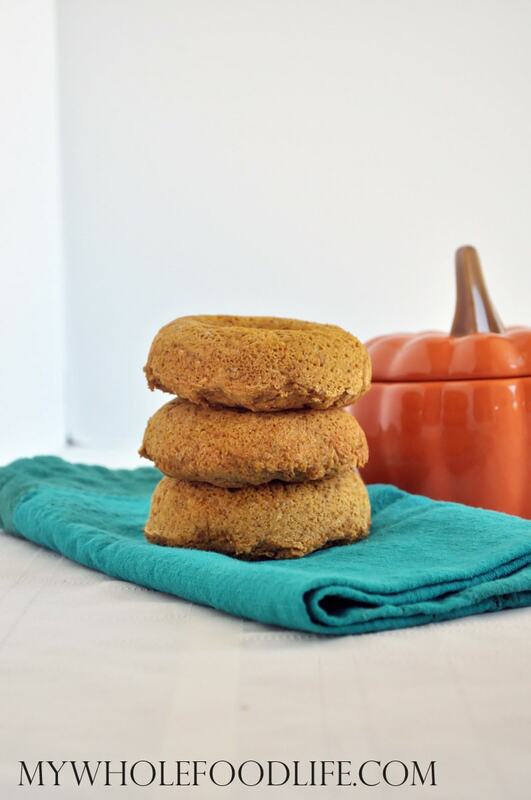 Pumpkin and chai go so well together in this healthy donut recipe. In one bowl , add the dry ingredients. Let cool completely before removing from the donut pans . Store in an airtight container in the fridge. They should last a couple weeks that way. You can also freeze them for up to 6 months. Melissa, these look amazing!!! My daughter has been begging for some kind of donuts and these fit the bill. You have done it again! Thanks Ursula! I hope you enjoy them! Where is the chia in the recipe? Made these tonight and I'm only slightly ashamed to say I ate two. Ok....Two and a half. The other half is calling me. Soooo good!!! So glad you liked them Angie! These are fantastic! I didn't have a donut tray so I made mini muffins - my 3yo loves them! I've had to put the lid on the container and hide them away or I'll have them finished before the other kiddos get home from school this afternoon! Yay!! That is so great to hear Kat! Hi, I was wondering can I use egg replacer instead of making flax eggs in the recipe? Mine do not look anything like these and I tried to follow your recipe. Hi Melissa. I made one batch of these with my new silicone donut pan. My family loved them. They had the weight and texture of a quick bread. I was just wondering if you have experimented with different donut pans. I almost bought a metal one today thinking that maybe they would rise more. I have only tried them in my non stick donut pan. They turn out great in that. Glad you liked them! Someone please remind me WHY I came to uni without my donut pans? Will these work as muffins? These are so good! Great recipe.